Oxaflozane (Conflictan) is an antidepressant and anxiolytic drug that was introduced in France in 1982 by Solvay for the treatment of depression, but has since been abandoned. 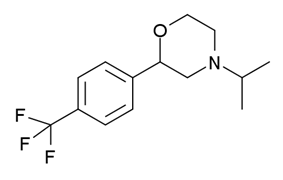 It is a prodrug to N-dealkyloxaflozane, which acts as a non-selective serotonin receptor agonist for the 5-HT1A (pKi = 7.1), 5-HT2A (pKi = 6.0), and 5-HT2C (pKi = 7.5) subtypes. Oxaflozane may also have anticholinergic effects in high doses. ^ Swiss Pharmaceutical Society (2000). Index Nominum 2000: International Drug Directory (Book with CD-ROM). Boca Raton: Medpharm Scientific Publishers. p. 766. ^ Sittig, Marshall (1988). Pharmaceutical manufacturing encyclopedia. Park Ridge, N.J., U.S.A: Noyes Publications. p. 1122. ^ Leysen DC (February 1999). "Selective 5-HT2C agonists as potential antidepressants". IDrugs : the Investigational Drugs Journal 2 (2): 109–20. ^ Dutertre JP, Barbier P, Suc AL, Jonville AP, Autret E (1992). "Oxaflozane overdose in a child". Journal of Toxicology. Clinical Toxicology 30 (1): 123–6. Rascol A, Maurel H, David J, Layani M (1974). "[Preliminary clinical results of a new non tricyclic antidepressive drug: oxaflozane]". Thérapie (in French) 29 (1): 95–9. Hache J, Duchene-Marullaz P, Streichenberger G (1974). "[Pharmacological profile of a new non tricyclic antidepressant: oxaflozane (1,766 Cerm)]". Thérapie (in French) 29 (1): 81–93. Constantin M, Pognat JF (1979). "Comparative study of oxaflozane urinary metabolism in man, the dog and the rat. Identification of the principal metabolites". Arzneimittel-Forschung 29 (1): 109–14. Bertolino A, palermo M, Porro V (1985). "Oxaflozane, a new nontricyclic antidepressant in the treatment of anxiety-depressions syndromes.". Acta Ther (11): 209–218. Aguglia E (1986). "On the therapetic value of axaflozane: Its application in the treatment of emotional disturbances of the anxious-depressive type accompanied by somatic manifestations.". Acta Ther (12): 259–267.